Samsung Galaxy Note 7 is officially launched in India at the price of INR 59,900 ($895) and will be available starting September 2. Most of the Samsung Fans waiting for the device and want to enjoy all the new features on the phone. And if you want to connect the phone to the Windows PC then you need the proper USB drivers or Galaxy Note 7 Drivers Windows. These Note 7 Windows USB drivers is pretty necessary. You need these Note 7 USB drivers to transfer files, pictures, videos, etc. between your Note 7 and a computer. And not only this you also need these to update your Note 7 with the help of KIES or ODIN software. With the below mention steps, you can Download & Install Samsung Galaxy Note 7 USB Drivers. This guide will work on any Samsung Android Phone and one of the quickest and easiest method to install the proper Samsung Drivers on any Windows PC. All you have just to download and install the Note 7 driver file like you’d install any other .exe file on your PC. These Note 7 Driver will work on all Windows PC (Win XP/2003/2008/2012/Vista/Win 7/Win 8/Win 8.1/Win 10 (32,64bit)). Step 1. 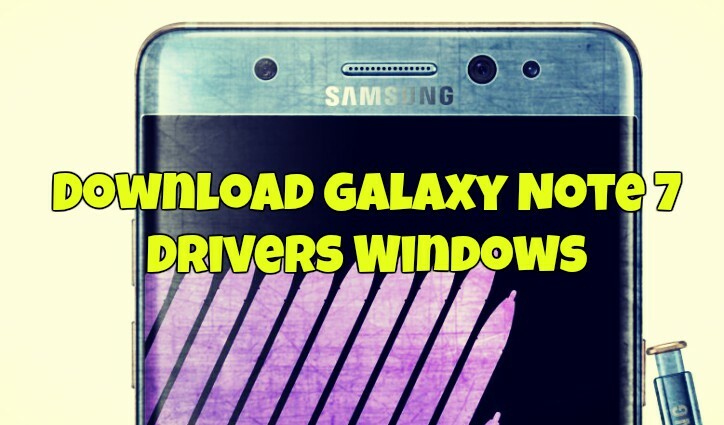 Visit this link and download the Note 7 Drivers Zip file for windows. Step 2. Now unzip or extract the folder on your desktop and you will see an exe file in the folder. Step 3. Connect your Galaxy Note 7 to PC with the USB cable, locate the USE driver exe file in the unzipped folder and double-click on it to start the installation process. Step 4. Now follow all the on-screen instruction to install the Samsung USB drivers on your Windows PC. Step 5. Onc ethe installation process is completed, Restart your System. Step 6. Now the Note 7 Drivers Windows are successfully install on your PC. If you have any question related to this post comment below. Is there an alternate address for the note 7 drivers or can someone email them to me?